Eating out can be fun (or necessary) sometimes and I love Mexican food (I even make my own taco seasoning) and it is relatively easy to find healthy food options there. Unfortunately, it is also pricey to go out to eat. Instead, I often make burrito bowls at home. 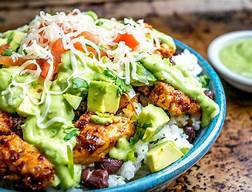 While chicken is heating, make guacamole or slice the avocados, wash and chop the salad greens, chop the tomato and onion, shred the cheese, get out the sour cream, heat up the beans, and make the cilantro lime rice if using.